It can’t be easy to create a hotspot destination from scratch. But that’s what Costa Navarino, a new resort community in southwest Greece on the Mediterranean Sea, aims to do. The first hotel to open (in May this year) was The Romanos, the latest addition to Starwood’s Luxury Collection (which also includes the SLS Hotel in L.A., the Grand Hotel in Florence, and Hacienda Temozon in Playa del Carmen, among others). The property’s 321 rooms – a third of which boast private infinity pools – look out over the sparkling Mediterranean or the surrounding countryside and come with sumptuous amenities like 250 thread count sheets, flat-screen TVs, and even butler service (in the suites). Opening rates start at €360/night. Not wasting any time, on July 1 Starwood opened the Westin Resort, Costa Navarino, a 445-room hotel adjacent to The Romanos. Set on over 300 acres of prime coastline, the two properties share the Bernhard Langer-designed Dunes golf course, the 43,000-square-foot Anazoe Spa, and a host of dining options ranging from Greek to Italian to American. For now, both Starwood properties are seasonal – The Romanos closes October 15 and the Westin on October 31 – but next year the Westin will stay open year-round. 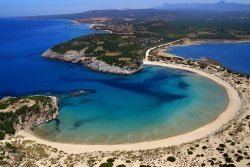 Upcoming construction projects in Costa Navarino include luxury villas dubbed Navarino Residences and an all-villa resort from Banyan Tree (set to open in 2013). Editor’s Note: While travel to Greece has been dicey due to a recent spate of strikes and protests, our sources say Costa Navarino has not been affected. Search for deals on airfare to Greece with our Travel Search price comparison tool. Find other great offers on luxe hotels and more with our Smart Luxury Deals.